The Horae are the Greek goddesses of the hours of the day. They preside over the revolutions of the heavenly constellations by which the year is measured, as well as guarding the gates of Olympus. 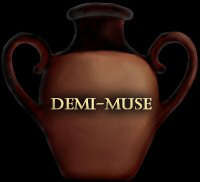 In the same way that the Horae stood at the gates of Olympus, the Demi-Muse of Bardic Web are here to greet new arrivals and to answer the questions of the writers who make our community their home.